When most people talk about swamp monsters in the comics, they think of Man Thing and Swamp Thing. Both of these mucky derivatives of Hillman's the Heap came out within months of each other in 1971, and then morphed into ongoing series. Because they came out so close together (initially Savage Tales #1, May 1971 for Man-Thing, House of Secrets #92, July, 1971 for Swamp Thing), and because the creators Gerry Conway and Len Wein were room mates, makes it rather confusing as to whose idea was first and therefore the 'original.' The answer is neither. Months before either of them came out, Skywald resurrected the Heap. Roy Thomas, in his introduction to the first Heap anthology, writes about sitting down with Sol Brodsky, who was looking for ideas for his new venture, Skywald Publishing. Thomas suggested that Brodsky revive the Hillman Heap. 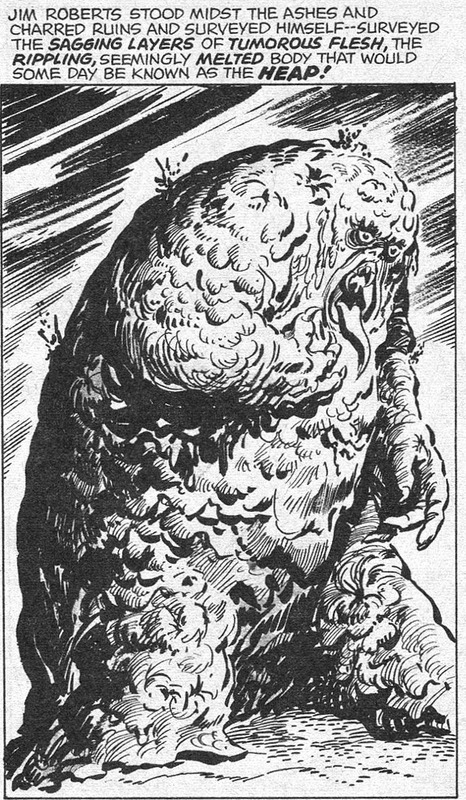 Roy Thomas will come up repeatedly as I work through the various generations of Heap-inspired muck men. His love of the character, combined with this productivity and the quality of his writing are very much behind the recrudescence of the Heap and similar swamp characters. Perhaps that lunch stirred more than just Sol Brodsky, because afterward, Thomas, who had already created the Glob, helped co-create Marvel’s Man-Thing. Skywald was a small comics publisher that established itself in 1970. The brainchild of former Marvel Production Manager Sol Brodsky and Israel Waldman, Skywald was looking to move into the niche that Warren Publications was currently filling. Printing primarily in black and white, Skywald avoided the scrutiny of the Comics Code Authority, allowing them more freedom to develop what they called horror-mood, and a certain amount of titillation. They produces a few color comics, mostly Westerns. But it was magazines like Psycho and Nightmare that really earned Skywald its reputation. In Psycho #2 (March 1971), the Heap was reborn. Like the previous Heap, it was once human, a pilot. Jim Roberts was a crop duster, one of the few biplane pilots left. Instead of being shot down into the Wasau swamp, Roberts crashes into a vat of chemicals, carrying on the catalyst trope, which began all the way back with Mad’s Outer Sanctum and came back with Roy Thomas’s Glob. In the seventies atmosphere of of anti-militarism, the chemicals are there for the army. Roberts’ death is the result of collusion between his girlfriend and Bill Ryan in order to collect a life insurance policy. The femme fatale will also show up in the origin story of Marvel's Man-Thing. More goopy than shaggy, the Heap retains the mind of Jim Roberts, although it cannot speak. So the book tends to center on the character, and his quest for redemption, which was a radical departure from the Hillman Heap. The new Heap is more a character than a plot device. But that doesn’t stop the stories from being wildly diverse, in the same way the original Heap stories were. Although shorter-lived, this Heap was involved in a broad range of plots. Central to the stories is Jim’s self-pity, but also his flashes of compassion. And although the Hillman's dietary habits were quickly shuffled to the wayside, the Skywald Heap seems to glory in the Heap slurping down rats. The Jim Roberts Heap is really the first muck monster that has retained its own mind, and there is a unique pathos to the human transformed into something hideous. Unlike Swamp Thing, who can speak with difficulty, the Skywalkd Heap cannot talk at all. And while it cannot hold a pen to write, it discovers that it is able to communicate by scratching words in the dirt. Like so many sentient muck monsters, Roberts spends a lot of his time trying to regain his human form, and an ongoing storyline allows him to partially succeed. This particular configuration, with the Heap able to think but not speak, allows for a lot of thought balloons, which have not been used to explore the thoughts of a muck monster before. And of course, these thoughts usually add to the pathos of the character. 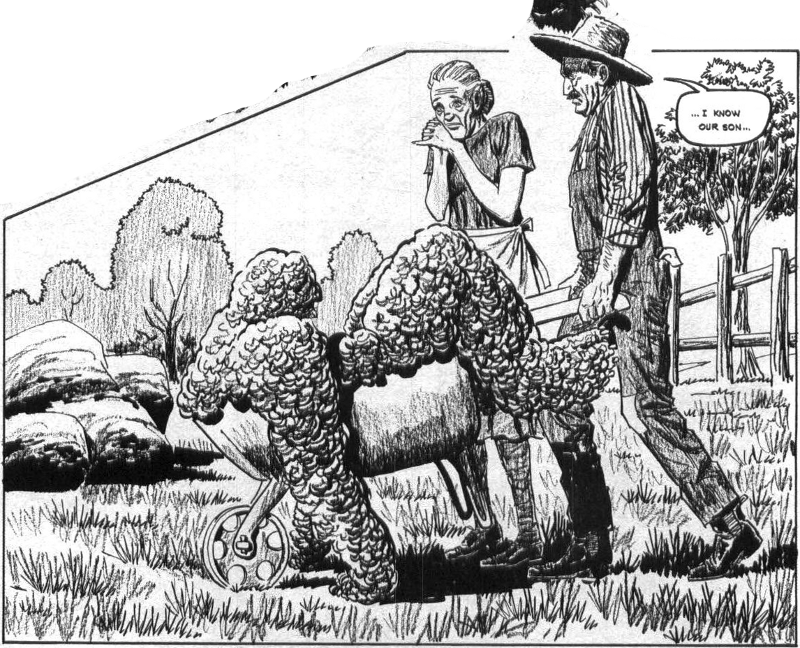 Many of these Heap stories presage ones that would later appear in Swamp Thing or Man-Thing. Psycho 11, for example, puts the Heap and apparently 18th century pirates together, something Steve Gerber will do in his later, legendary work on Man-Thing. In the same issue, the Heap battles a werewolf, which Swamp Thing will do in Swamp Thing #3, and Garbageman will do the same thing. Strangely, it’s not until the Pasko Swamp Thing that a muck monster will face off against a vampire. The Heap was a bit of an odd fit for Psycho magazine, but it proved popular. The magazines had other characters with multiple issue story arcs. The Frankenstein creature and the Mummy both had several stories, although the majority of the magazines were one-shots, usually with a nonfiction article or review on a horror-related topic in the middle. The initial story, with the Heap’s new origin, was written by Chuck McNaughton, who wrote the stories in Psycho 2 and 3. Psycho 4’s story, “Night of Evil,” was written by Ross Andru. Robert Kangher, later famous for such war comics as Sgt. Rock and WWI flyer Enemy Ace, wrote the single issue color comic. After Psycho6, Andru handed the writing chores off to Al Hewitson, who apparently hated it. 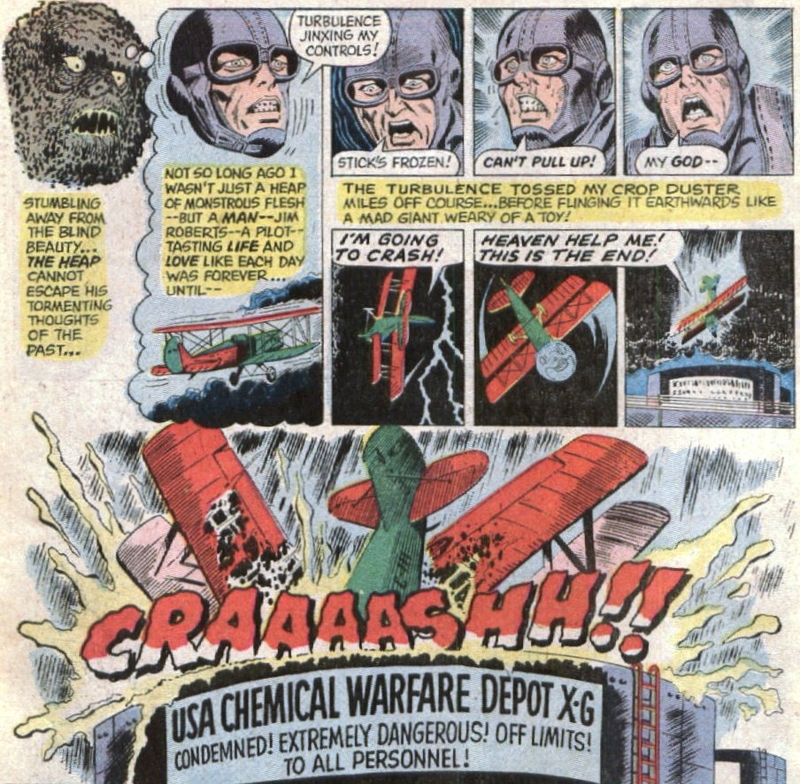 The Heap wasn’t in issues 8 and 9, but with reader demand and no one else to fill the void, Hewitson continued to write the character. Psycho 10 and 11 feature outre stories of animated fossils, pirates, and a werewolf. Beginning in Psycho 12, Hewitson lost all love for the Heap. Somehow, the Heap lost its ability to speak, or reason, the Heap becomes an evil, horrible creature, killing without reason. But again, these are ideas that are used later by Len Wein. In fact, the idea of a second, monstrous Swamp Thing was used in later issues of the original Swamp Thing. The Heap is hauled into the air by a helicopter with a claw, which will happen in Swamp Thing 6 (October 73) "Clockwork Horror" just five months later. The Heap is dropped down an elevator shaft, then smashed by a subway train. In Psycho 13, The Heap kills a child (off-screen, but still). Following an increasingly improbable series of events, the Heap finds itself on his parents' farm, and able to speak for the first time. Hewitson was clearly done with the character. According to the Swamp Men article, Hewitson was doing his best to make sure the Heap was disliked. Psycho continued to sell until Skywald folded, but this was the end of the Skywald Heap. There's a mention that they are trying to get it back on track in the letter column of Scream #11 (Winter, 1975) but that never came to fruition. Apparently, the Skywald version of the Heap was resurrected by a UK semi-pro zine called Bedlam magazine, which is very obscure. The only serious reference I can find for it is On the Wayback Machine, but the scripts apparently are by Skywald Heap scribe/artist Ross Andru. I’ve spend a fair amount of time searching for any copies of the magazine, and I am unable to find any at reasonable prices. Or even which of the six issues contain Heap stories. If this article has given you a taste for Skywald's Heap, you're in luck. The majority of Skywald's output is available from the Internet Archive. the Internet Archive. The only issue missing is Psycho #6. Unfortunately, Psycho 12 has been mislabeled, so it appears Psycho 6 is available, but it is not. Skywald’s Heap is something of a trailblazer in the field of the swamp monster. It si clearly influential with the individuals, Len Wein and Steve Gerber, who would make their Man-Thing and Swamp Things so famous. It is also the first swamp monster that retains its mind, and therefore is an actual protagonist. It seems there was something in the air in early 1971. After decades of fitful sputtering, three swamp monsters rose from the mud, two becoming regular characters in their relative superhero universes. Muck men would cross the paths of such prominent characters as Batman, Spider-Man, and Ka-Zar. Next up, I’ll be looking at first of these now-legendary writer/creator combinations. Steve Gerber writes the Man-Thing.